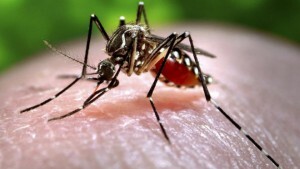 Chikungunya (pronunciation: \chik-en-gun-ye) virus is transmitted to people by Aedes aegypti and Aedes albopictus mosquitoes, the same mosquitoes can carry Zika virus and dengue fever. The most common symptoms of ChikV infection are fever and joint pain. Other symptoms may include headache, muscle pain, joint swelling, or rash. This disease does not often result in death, but symptoms can be severe and disabling. People at risk for more severe disease include newborns infected around the time of birth, older adults (≥65 years), and people with medical conditions such as high blood pressure, diabetes, or heart disease. Most people infected with the disease will develop some symptoms, but once a person has been infected and recovers, he or she is likely to be protected from future infections. ChikV outbreaks have occurred in countries in Africa, Asia, Europe, and the Indian and Pacific Oceans. In late 2013, this virus was found for the first time in the Americas on islands in the Caribbean. There is a risk that the virus will be imported to new areas by infected travelers.